There is a good chance you have heard of the East Pacific Red Octopus. They are small in size and have a body that is about three times smaller than the length of their eight arms. Fully grown they weigh about 5 ounces. They can be about 20 inches in overall length as adults. The males and females are almost identical in their size so it is hard to tell them apart based on appearance. They are able to blend in very well to their surroundings all the time. This is possible due to the pigment changing abilities in the body. Therefore you will find them in a variety of different colors out there. They can often be right in front of you and unless you know to look for them you won’t realize you are staring at an Octopus. However, their primary coloring is a shade of red. They can also have shades of brownish red coloring for their bodies. Some of the various colors it can change into include yellow, white, and brown. This Octopus has a very large distribution area. It spans across the West Coast of North America. It is one of the largest spans out there too. They have been found from the coast of California all the way up to the cost of Alaska. They tend to live in the shallow water areas. Most of the time they don’t go deeper than 300 feet into the waters. They will though if they are having a hard time finding enough food. 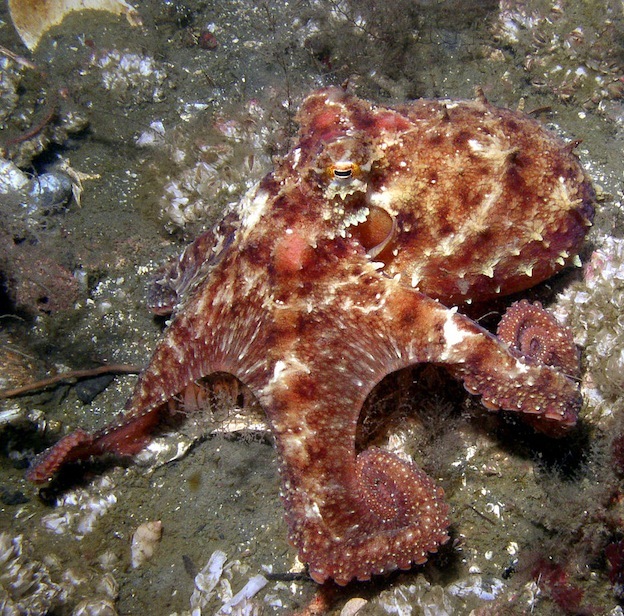 The East Pacific Red Octopus is very intelligent and has been tested in a variety of areas. Researchers known that they are able to problem solve and that they have excellent memories – both in regards to the short and long term. The East Pacific Red Octopus doesn’t seem to be as picky when it comes to their diet as many other species of Octopus. Generally, they will take the opportunity to consume whatever foods they can find in the wild. Crabs, clams, and scallops provide them with the majority of the intake for their diet. They will also consume some types of fish when they have an opportunity to do so. They have a peculiar method to their dining habits though. Instead of consuming their food where they capture it they will gather many different foods. Then they will retreat back to their home environment where they can enjoy it all at their own pace. If what they take with them isn’t enough they will consume it and then go explore for a second round of food. The shells that they remove from their prey are normally stacked outside of their home. This is a telling sign that some species of Octopus is residing in that particular area. They tend to relocate often though so those piles of shells could become a vacant location in no time at all. The male and female East Pacific Red Octopus will only interact with each other for mating in late August and early September. Then the females will deposit eggs in the early winter months. It takes about 8 weeks for the eggs to be ready to leave her body. They generally search for rocky areas where they can hide those eggs from predators. The females will be very close to death by the time her young start to hatch. As soon as they start to emerge she will go her own way. The young are able to swim and look for food immediately. They are extremely vulnerable though and the mortality rate is about 90%.